Coordinators: Petre G., Sanfeld A. 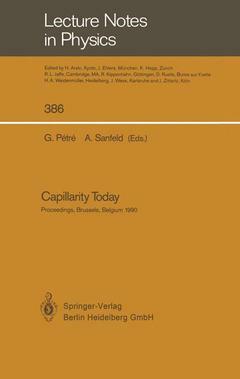 Beginning with Nobel laureate I. Prigogine's lecture "Entropy Revisited", this book gives a well-balanced survey on capillarity properties at liquid and solid interfaces. It approaches the subject from both the microscopic (statistical mechanics) and the macroscopic (mechanics and thermodynamics) points of view. Experimental aspects and technological applications are also presented. The book addresses researchers and graduate students of physics and physical chemistry. Entropy Revisited.- Adsorption and wettability in metal/ceramic systems.- Equilibrium surface segregation in solid binary alloys.- Spreading of a stratified, incompressible, droplet.- Line tension and wetting.- Liquid-solid coexistence: A density-functional approach.- Phase equilibria and adsorption of fluids confined in narrow pores.- Capillarity in porous media.- Capillarity in microgravity.- Solitons and other interfacial waves excited and sustained by capillarity.- Solid surfaces : Capillarity vs Elasticity.- Interfacial tension of organic solutions.- Session 4: Surface Tension of Solutions Line Tension Line tension and its application to the theory of heterogeneous phase formation.- A topological constraint on the Variance.- The necessity of ideal organized solution concept: The comparison of ideal solution and ideal organized solution.- Ions in »Solution« and in weak ion exchange membranes.- Thermodynamics of charged interfaces.- Thermodynamics of micelles.- Non-monotonous temperature dependence of interfacial tensions.- Surface tension measurements of liquid metals.- The double layer at the interface between two immiscible electrolyte solutions.- Orientation thermodynamics at polymer — liquid interfaces.- Marangoni-driven solitary waves.- Growth instabilities of bubbles and drops.- Competition between Surface and Volume Reactions.- Capillary crawling on inhomogeneous solid surfaces.- The role of the Soret effect on Marangoni-Benard stability.- Various optical diagnostic techniques for microgravity experiments.- Holographic visualization of interfacial phenomena.- Wetting of pore walls by oil or brine in reservoir rocks.- Some industrial applications of surfactants.- On superficial and interfacial phenomena in powder metallurgy.- Marangoni's Effect in welding.